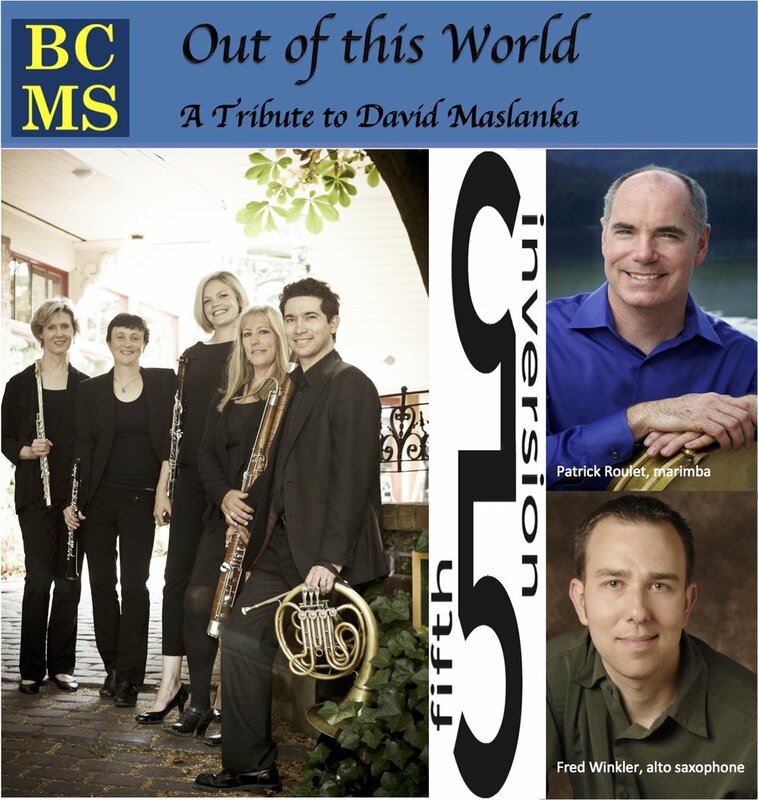 David Maslanka's other-worldly, gentle spirit permeates his music. He has been celebrated for his immense contribution to wind, brass and percussion literature, and finds a unique soul in their voices. This celebration of his music will present Wind Quintet No. 3, Little Concerto for Six Players, and selections from his Song Book for alto saxophone and marimba. Featuring Fifth Inversion Quintet, Patrick Roulet and Fred Winkler. Fifth Inversion's Erika Block will be presenting a class on the history of the woodwind quintet through WWU's Academy for Lifelong Learning. Classes will meet Tuesdays, March 20 and 27 from 1:00pm-3:00pm at the Fairhaven Ferry Terminal. Registration available through WWU. The March 20 class will include a discussion and listening to recordings, with some history and background on the woodwind quintet. March 27 features a discussion with Fifth Inversion and a performance of a selection from Maslanka Quintet No 3. Join us for a wild and wonderful transformation of classical, contemporary and jazz styles through the compositions of 2006 MacArthur Fellow John Zorn. Program will feature Zorn's Trilogy for piano with improvised bass and drums and Antiphonal Fanfare for the Great Hall transcriptions from Zorn's "Masada" tunes and a performance of the game piece Cobra. A rare treat for Bellingham chamber music fans! Featuring Kevin Woods, Milica Jelaca Jovanovic, Roger Yamashita, Christian Casolary, Steve Treseler, Bruce Hamilton, Pat Nelson, Melanie Sehman, Jordan Watson, Amy Feeney, Sage Romey, and students from the WWU trumpet studio. A modern chamber music concert blending elements of classical, jazz and contemporary styles while capturing the communicative and integrative spirit of ensemble playing. Program features classical works reinterpreted from a jazz perspective, and original jazz compositions arranged for woodwinds and rhythm section to create a unique, ambient blend of these two worlds. Music by J.S. Bach, Dave Brubeck, Chick Corea, BJ Block and others! Featuring BJ Block, Roger Yamashita, Christian Casolary, Erika Block, Pat Nelson, Lisa McCarthy, Jennifer Weeks and Gustavo Camacho. Come join us for an afternoon of chamber music featuring Beethoven's String Trio op. 9 no. 3 in C minor, Chopin's Piano Concerto in E minor, op. 11 for chamber ensemble and a rarely heard bass/bassoon duo by Franz Anton Leopold Keyper. Featuring Milica Jelaca Jovanovic, Grant Donellan, Laura Camacho, Coral Marchant, Pat Nelson, Spencer Hoveskeland and Eric Kean.